A town in the Lugansk region has come under attack by Kiev's APCs, while in the Donetsk region Ukrainian troops have seized four polling stations, self-defense forces claim. This comes as autonomy referendums kick off in the country's southeast. Novoaydar election commission was reportedly evacuated by self-defense activists, after it had been attacked by National Guard troops. At the same time, representatives of another Lugansk region self-defense group, based in Krasny Luch, told RT that they have seen APCs in the region, but have not heard any fighting yet. Reports of sightings of Ukrainian APCs in various towns and villages in Lugansk region have been coming in throughout the day. One report said that as many as 45 APCs and two helicopters were moving from the Kharkov region in the direction of Lugansk. 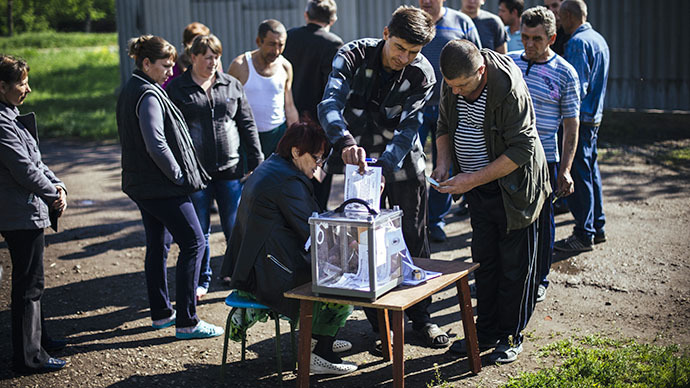 On Sunday, Donetsk and Lugansk regions opened polling stations for a referendum seeking autonomy from the central government. Local self-defense forces boosted security, fearing that Kiev could stage provocations to disrupt the self-determination vote. Voting in four towns across Lugansk region has already been disrupted, as military vehicles block passage to polling stations, representatives of referendum coordination council told Interfax. “In four districts – Belokurakinsky, Svatovsky, Troitsky and Melovsky – APCs of the Ukrainian National Guard do not let residents pass to the referendum polling stations,” the sources said. Kiev’s armed forces also entered the town of Krasnoarmeysk in the Donetsk region and seized four school buildings where residents were voting in the referendum, Denis Pushilin, co-chairman of the Donetsk People’s Republic, told Itar-Tass. All the people in the election district were evacuated, he said, adding that all voting bulletins were saved and taken away by the electoral commission. Voting was also stopped. "They threatened us and said that they were sent by the Kiev authorities," Sergey, a local resident, told RT. He added that there were no casualties. 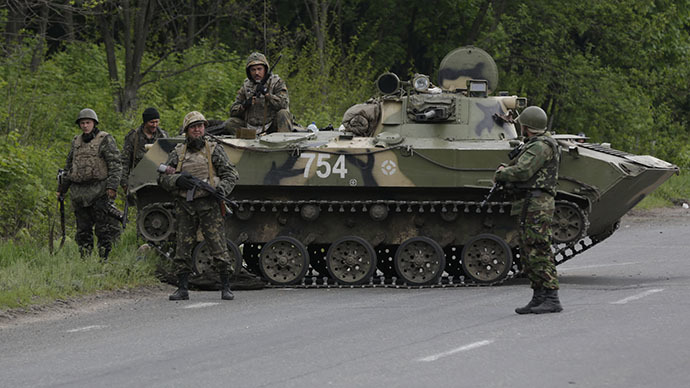 Earlier in the day, shooting and artillery fire was heard on the outskirts of Slavyansk, in southeast Ukraine’s Donetsk region, RIA Novosti reported, citing its correspondent in the area. 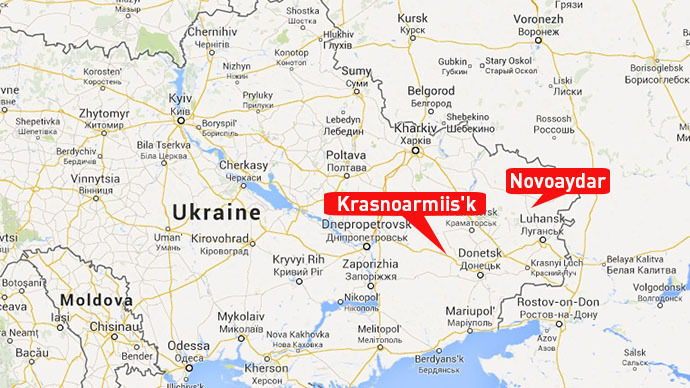 There have also been reports of a military operation going on in the town of Krasny Liman. Those emerged after communication was lost with two territorial self-determination referendum committees there, according to the head of the Central Election Commission of the self-proclaimed “Donetsk People’s Republic,” Roman Lyagin. 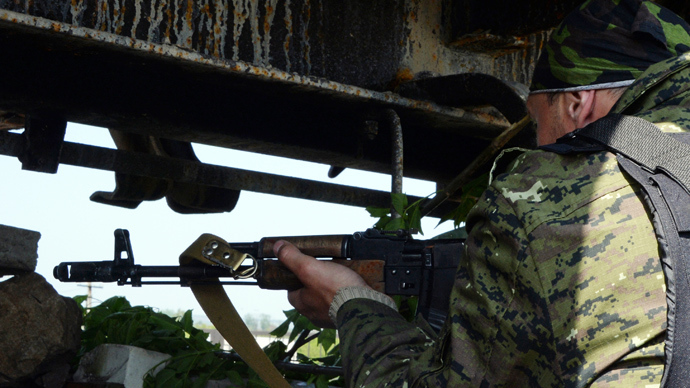 About 1,500 residents of Barannikovo in Kremensky district of the Lugansk region are attempting to prevent Ukraine’s National Guard’s tanks and armored vehicles from entering their village, according to local self-defense. “I am hearing gunshots through the phone. 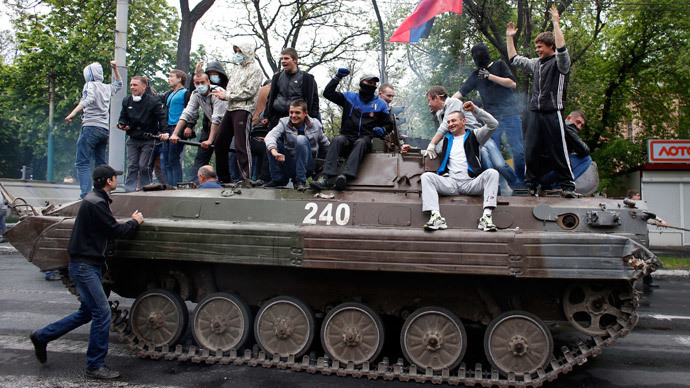 I know that two people have been wounded,” Vasiliy Nikitin, the head of the press service for Lugansk People’s Republic referendum on independence told Interfax on Sunday. Meanwhile, the acting head of Ukraine’s presidential administration, Sergey Pashinsky, said Kiev’s military operation in the Donetsk region towns of Krasny Liman, Slavyansk and Kramatorsk was in its its final stage, adding that “a lot of separatists have been eliminated during the operation.” He would not provide any figures thought. 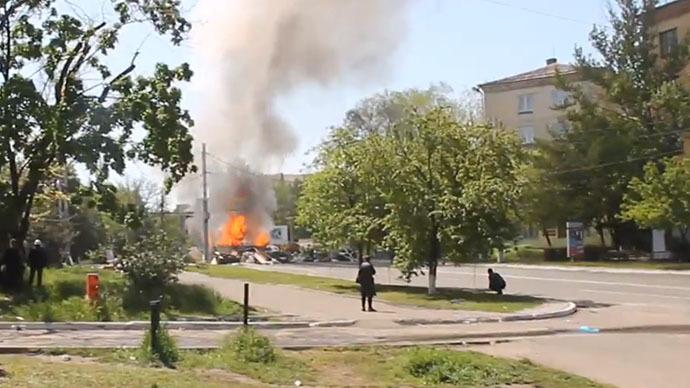 During the military crackdown, the self-defence checkpoints near Slavyansk, Kramatorsk and Krasny Liman were destroyed, Ukraine’s Interior Ministry said, adding that there were no casualties among civilians. 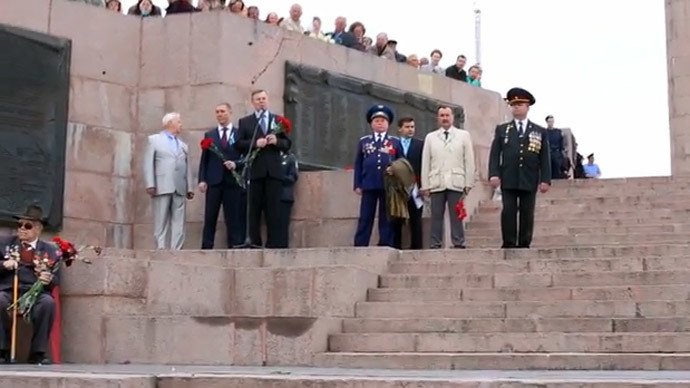 There is no information yet about the number of victims from the self-defense forces.